To create a compelling story for your next film, try gathering a group of photos and selecting eight that suggest a story. Director/producer Ron Howard and his daughter, actress Bryce Dallas Howard, did just that in a recent Canon contest. Almost 100,000 photos were submitted in eight categories, then narrowed down to a small set of finalists. Ron Howard stepped in and selected the final eight. Bryce Dallas and her writing partner Dane Charbonneau will now create a story based on the eight photos. Go here to see the final photos and read the full story. Mediaburn.org offers video clip collections for documentary videmakers and media teachers. The site features a collection of video material on various topics from a number of dedicated and experienced documentary filmmakers. One videomaker, Andrew Jones, has taped conflict and strife in cities and war arenas across the world. Scorpions is a sample of his work from his “Global Perspectives on War and Peace” collection. The site could also serve as a source for story ideas. Check it out. Set your story on the edge. Put your characters somewhere beyond their comfort zone, right at the edge of something unknown. Some call this place the edge habitat. In the world of nature, an edge habitat could be the edge of a heavily forested area. Some bird species, for example, will not thrive on the edge of the forest, but prefer the cooler and damper interior. Clearing land or building a highway through part of the forest will create edge habitats for species that are then forced to deal with change. In storytelling, an edge habitat is a unique place. A young woman’s edge habitat may be the weeks just after graduation from college. What do I do now? My college days are over. No more structured social life. No job prospects in a down economy. College friends gone back home or moved on to new locations. Do I move back in with my parents? I’m on the edge. In strict terms there may not be many definable edge habitats. Sure, movie stories are full of lead characters who find themselves in an unknown situation and must find their way back out. It’s a common story device. We think the edge habitat is different. An edge habitat could be the environment in a company where job layoffs are imminent. Your character must adapt to the uncertainty. For an elderly person, it could be a nasty fall, which leads to the almost certain move to a nursing facility. Don’t be afraid to take your characters to the edge. We read about the concept of edge habitat several years ago and cannot recall where. Contact us if you know the source, and we’ll attribute it. Every scene in your story needs conflict. Every scene. Your protagonist has to fight her way through multiple conflicts – small or large – until the end of the story. In his book, Hooked, Les Edgerton says, “In fiction… you need to seek out trouble for your protagonist at every opportunity.” This means both the major conflicts between the protagonist and the antagonist as well as minor problems with daily life. She gets a traffic ticket, has her car towed, loses her house keys, breaks a heel, can’t find a hotel room, loses her favorite pen. Life cannot be easy for her. And this occurs in every scene of your story. Think, too, about applying this element to the documentary you’re working on. You may be interviewing your great-uncle about his life story. Coax out some of the troubles he may have faced as a youth. Was he an immigrant to this country? How did he learn the language? What prejudices did he face? Your family will no doubt be quick to forget the hard times they faced. It isn’t easy to talk about the death of a spouse, a brother’s drug addiction, divorce, bankruptcy, a job loss. But gently probing these memories will reveal your family’s strength. How they survived conflict is the story that defines them. Don’t be afraid to look for it. As a storyteller, you face the challenge of bringing your characters to life. How they speak will cause them to jump off the page/screen, or leave them inanimate. Dialogue is critical. No two people speak precisely the same way. The novelist and screenwriter Rita Mae Brown, in her book Starting from Scratch: A Different Kind of Writers’ Manual , discusses how to make your characters’ dialogue ring true. Brown explains that the English language originated from and still comprises two languages: the original Anglo Saxon component and the later Latin/French element. These dual roots give the English language a unique richness, full of synonyms and subtle shadings of meaning. There is great potential for nuance, Brown says. What does that mean for your characters? A worker on a Detroit automaker assembly-line will probably use the Anglo Saxon vocabulary, including lots of four-letter words and staccato speech rhythms. A lawyer in a firm housed on Avenue of the Americas in Manhattan will likely use words with Latin roots and speak with a smoother cadence. This, of course, is an oversimplified example, but you get the point. We’re not talking about the jargon that surrounds any profession or lifestyle. The Manhattan lawyer and the assembly-line worker may easily use the same terms when talking about last Sunday’s football game. But get them talking about the political arena and their vocabularies will change dramatically. Even a roomful of 13-year olds will exhibit nuances in their language. Learn to listen for the subtleties. A keen ear will help (Anglo Saxon)/assist (Latin) you in creating dynamic and memorable characters. To tell your story effectively, build an arc. Your lead character must change between the beginning and the end of your story. Her journey will involve multiple conflicts, forces that wish to divert or destroy her. She will work through each one until – changed in heart – she emerges a stronger person. Many of you are probably writing short films, even five-minute movies. The need for an arc is just as critical. You’ve simply got less time to effect a change in your character. Short stories require you to jump in right away. No introductions, no setups, no lingering wide shots. Jump in. Your character just got thrown out on the street after being trounced in a bar fight. Start here. Now what? He may be broke, despondent, uncaring about being beaten. He may jump up and start back in for more. But someone helps him up, wipes off his bloody face, takes him for a cup of coffee. Why? Is he being suckered into a larger adventure? Where do you want to take us? Move your character, perhaps, from the bar scene to a respectable restaurant and the appropriate demeanor to match. Move him to caring about something. In a short film, your arc is brief. No mythic structure or hero’s journey. It may only be a walk down the street. But however you do it, take your character somewhere. Which means, of course, take your audience there too. Take a look at producer and story analyst Karel Seger’s The Story Department. Lots of good advice on storytelling. For more on story structure, and to see a further explanation of the above chart, see articles by Peder Hill. Many screenwriters dive into writing the script immediately, according to Keane. The result can often be both frustration and mediocrity. 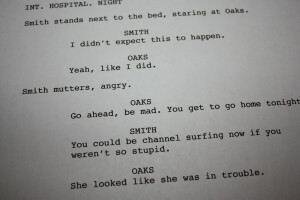 Keane proposes five steps to getting a great script. Document the main idea in one to two pages. Next write a mini-treatment. Follow with a scene breakdown. Then develop the expanded scene breakdown. Finally, write the script. Writing a good expanded scene breakdown can take six months, Keane says, but then the script can often be written in just a couple of weeks. Keane’s article on the expanded scene breakdown appeared in the March 16, 2005 “Expert Series” in the online newsletter published by The Writers Store in Los Angeles. The newsletter is an invaluable resource. Digital filmmakers don’t always have the budget or the time for a storyboard artist. Yet the storyboard remains a critical step in the pre-production process. The Cinemek company has an iPhone storyboard composer app available on iTunes called Storyboard Composer. The app offers the digital filmmaker the opportunity to storyboard and previsualize on a mobile basis with ease of access. With the app you can take a photo on the iPhone or import a photo, then create a panel where you can add common notes such as pan, zoom and dolly. Storyboard Composer also allows you to insert stand-ins into the panels. On a much simpler level, there is no need to be an artist. Even a stick figure will convey the content of the shot. Save each sketch as a panel and then email them to yourself if you need to print them. Or forward them to a partner’s phone for their reference. Where do you get a good story idea for your digital movie? Try Writing the Natural Way . Let’s say you’re working alone trying to write a good story. Try “clustering”. Begin with a word or phrase. Put it in the center of a blank page and circle it. Then for about 10 minutes cluster words around the key word as they occur to you. Don’t stop to edit or change. No hesitation. Just keep going. After 10 minutes or so you will sense a direction. Take another 10 to 15 minutes to write a story or comments about what you’re feeling. Again, no stopping, no self-editing. Let the words and thoughts flow freely. Now you’ve got a cohesive written piece. It may be the core of an entire story. It can certainly be a jumping off point for you. It may be only a journaling piece. Save the journaling pieces – they will come together later. For more information, go to the creator of this clustering concept, Gabriele Rico. 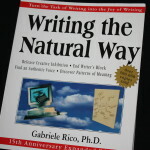 Her book Writing the Natural Way is an excellent guide for the creative writer. Some other authors call this idea Mindmapping. You can develop a good digital film story working with a small group of friends or collaborators. This will involve brainstorming: a fun creative process! The principles of brainstorming: all ideas are welcome; no stupid ideas; no editing. Whatever you say gets written down. Let the ideas flow freely. And don’t be afraid of some moments of silence. Let it gel into more ideas. Okay, you’ll need a few tools for this process. Ideally, use a whiteboard or flipchart. You can improvise with a piece of foam core or even the back of a long piece of gift wrap. Grab blue painter’s tape to hang the paper on a wall or door. Write it all down with a marker pen. If you’ve got paper hanging on a wall, be sure the pen won’t come through on the wall! Brainstorm for at least 30 to 60 minutes. Enjoy the process. Watch for ideas that link up with others. Let ideas feed off one another. When you stop brainstorming, go back and begin editing the ideas. Work at this for a while and you’ll see a direction you want to go in. Every digital film story needs a beginning, a middle, and an end. Sounds obvious, doesn’t it? Not so obvious, actually. Where’s your beginning? Start your story with an impact. Your audience doesn’t need to see a long introduction. Start at the latest point you can. Let’s say your movie is about a high school girl band struggling to win a place in a school competition. No one wants to see how four friends started their band, how they acquired instruments and began to rehearse. No, start exactly where the real story begins – maybe the middle of a tense rehearsal where nerves are on edge and friendships are strained. Now your middle. Keep your audience interested and caring about what happens. This is tough. Many stories fall apart here. A strong beginning can easily trail off into boredom. Your characters have to keep us involved. The end. Make it real. Make it exciting. Leave the audience feeling like it was worth their while to stay with your story. Your girl band doesn’t have to win the school competition. Perhaps they don’t even have to remain friends. But they do have to accomplish something, perhaps placing third in a boy-dominated contest, perhaps paving the way for one girl to win a shot at a scholarship to a music college. That’s it. Beginning, middle, end. Check the print review of Christina Hamlett’s Screenwriting For Teens on the School Video News website. She offers 100 concepts that would help writers of any age.